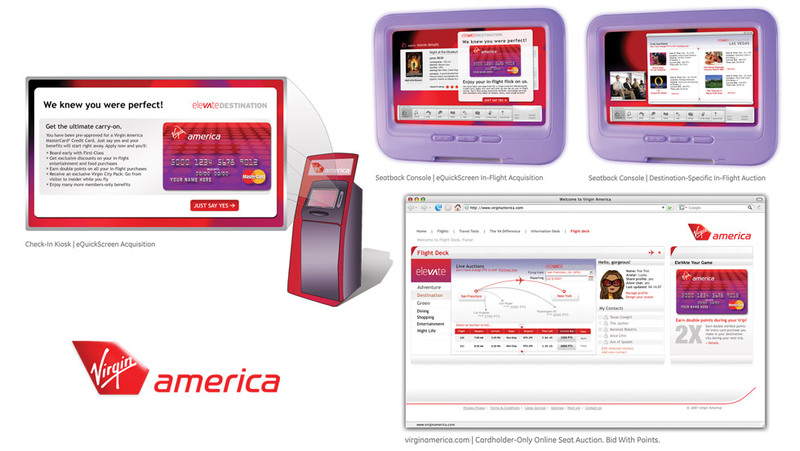 Interactive customer lifecycle marketing collateral and product positioning for a Virgin-branded credit card. Components included a viral online game, in-flight marketing, check-in kiosk screens, and enhancements to Virgin America’s Web site. Viral game: Competing against the clock, players accumulate points by making virtual purchases with a Virgin America MasterCard as they race through one of 8 destination cities in a customizable BMW Mini. The highest scoring players are eligible to play the game in real life with preloaded credit cards.